To celebrate Ford’s return to the Le Mans 24 Hours endurance race 50 years after recording an historic 1-2-3 victory in 1966, the #66 Ford GT race car is now available to drive in the Forza Motorsport 6 racing game for Xbox One. This year Ford is running two Ford Chip Ganassi Racing Ford GTs in the FIA World Endurance Championship and two in the IMSA WeatherTech SportsCar Championship. All four Ford GTs will compete for GTE Pro class glory at the Le Mans 24 Hours that starts at 15:00 CET on June 18 in France. The Ford GT race car is based on the all-new Ford GT supercar, which is the pinnacle product of the Ford Performance division. With state-of-the-art aerodynamics, lightweight carbon fibre construction and a powerful and efficient Ford EcoBoost engine, the Ford GT has been built to go head-to-head with the GT establishment – Ferrari, Corvette, Porsche and Aston Martin – as they fight for victory in the ultimate endurance battle. 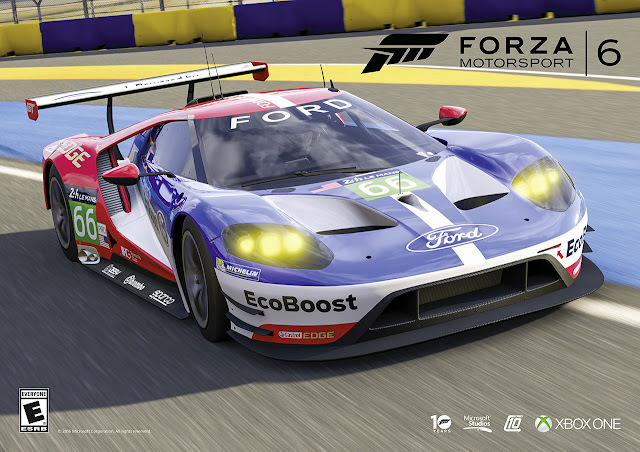 The Forza Motorsport 6 cover star Ford GT road car – expected to start arriving in customers’ garages by the end of 2016 –has been available to drive in-game since the launch of the acclaimed title last year. For the Le Mans 24 Hours the two WEC Ford GTs retain their #66 and #67 race numbers while the IMSA cars become #68 and #69, celebrating Ford’s back-to-back Le Mans victories in 1966, 1967, 1968 and 1969.